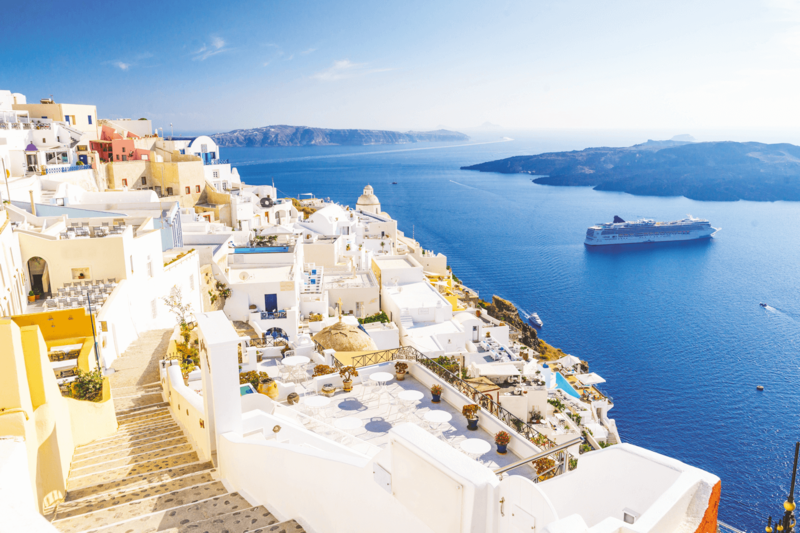 Known for its incredible volcanic scenery, fascinating ruins and the most famous sunsets in the world, a visit to the Greek island of Santorini does not disappoint. Here’s our ultimate guide on the best things to do in Santorini. The Greek island of Santorini is one of the southernmost of Greece’s islands, found in the Aegean Sea. One of the Cyclades islands, Santorini’s uniquely curved western coastline is a clear reminder of the fact the island was left behind as a remnant of a massive volcanic eruption in the 16th century BC, leaving behind a collapsed caldera that is now largely under the sea. Santorini covers an area of just 28 square miles, making it the perfect size to explore properly while on holiday there. This enchanting clifftop village exudes the postcard-perfect charm that makes the Greek islands so beloved. Narrow winding roads, whitewashed houses with vibrant blue roofs and glimpses of the twinkling sea greet you at every turn. This is a place to shop for souvenirs and traditional crafts, then have a coffee, lunch or dinner. 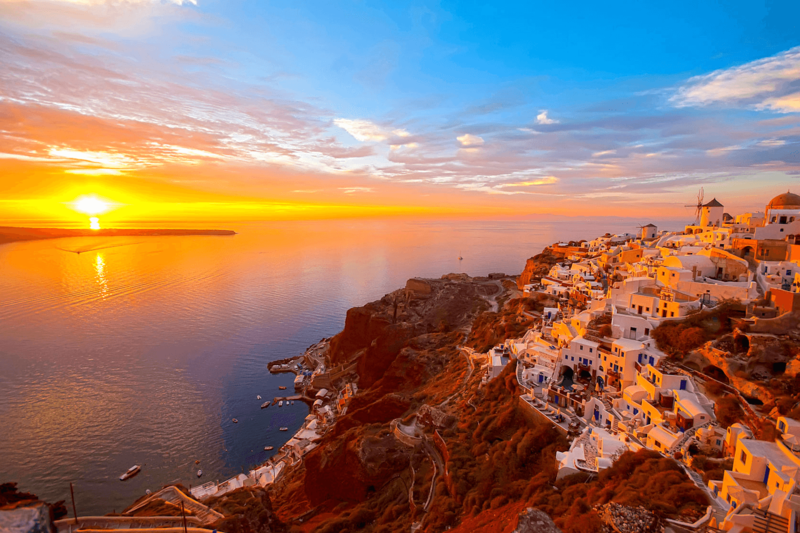 However, Oia is best known for its sunset, said to be the best sunset in the world. Gather together with others at the castle to watch it, or book a table with a sunset view at one of Oia’s restaurants. The Fira to Oia hike is also a popular activity in Santorini, and takes between two and five hours depending on which route you take. Ammoudi Bay below Oia is also a picturesque spot to go for a meal. 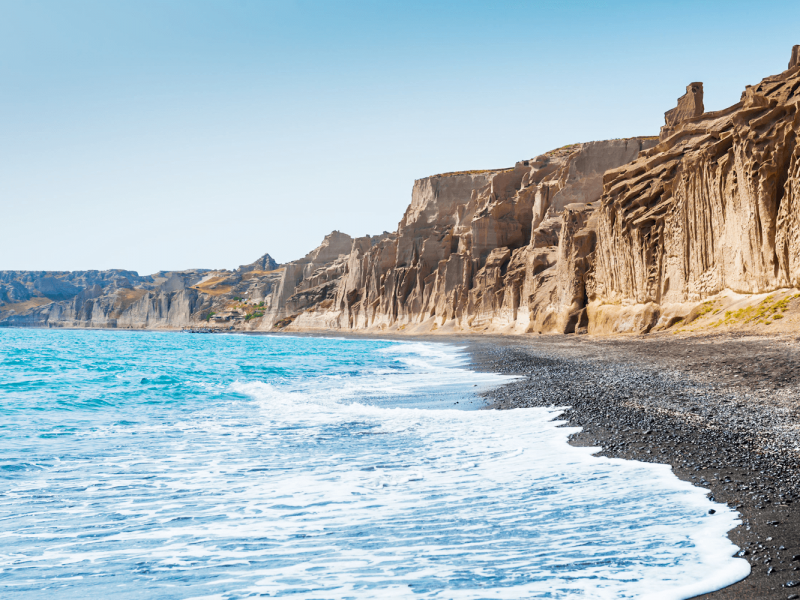 History fans cannot fail to visit the archaeological site of Akrotiri – one of the most fascinating places to visit in Santorini. This former town was a Minoan Bronze Age settlement that was buried by the historic volcanic explosion in the 16th century BC. Incredibly well-preserved, the volcanic ash even protected detailed frescoes and other works of art. Akrotiri is open on Wednesdays and Fridays from 08:00 to 18:00, and Thursdays from 08:00 to 15:00. Tickets cost €5. 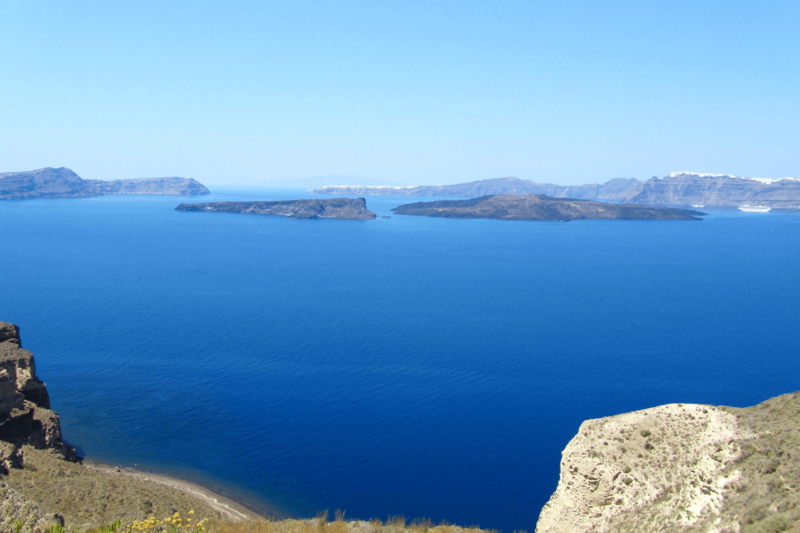 The two uninhabited islands in the middle of Santorini’s caldera – Nea Kameni and Palea Kameni (meaning ‘new’ and ‘old burnt islands’) – were formed 450 years ago and 2,000 years ago respectively. Get a closer glimpse of the heart of Santorini’s former volcanic activity by embarking on a boat trip to see these islands, widely hailed as being some of the best things to see in Santorini. On Nea Kameni, it’s even possible to walk to the top of the 130-metre high crater. Palea Kameni is home to hot springs where you can soak and swim in the healing waters. Take a boat tour to the islands later in the day to take in Santorini’s sunset too. Sunset tours including visits to Nea Kameni and Palea Kameni start from €35 per person and last up to five hours. The top of this mountain marks the highest spot in Santorini, worth visiting for the immense views of the island and the surrounding deep blue sea. The mountain is also home to the Profitis Ilias Monastery, a pretty 18th century sanctuary, where you can visit the small chapel and buy goods made by the monks themselves. This small hilltop village is a little further off the beaten track compared to some other Santorini spots, making it the perfect place for a stroll and some quiet reflection. In particular, enjoy the tiny churches and cafés offering sumptuous views. This 17th century village has a prominent history of wine and trade, which is still reflected in the architecture today, characterised by small wineries and merchants’ houses with high walls and elegant courtyards. Wander around to soak up the feeling of past times and to have a coffee at a pavement café in the square. The ruins of this ancient city are found on a hilltop accessible from Kamari. Drive there, join a small tour to the top of the hill, or hike along one of several footpaths if you’re feeling more adventurous! Wander along the ancient streets – which date as far back as the 9th century BC – and take in the ruins of houses, temples and a theatre. Watch a film under the stars in a delightful garden setting at Kamari’s open-air cinema. Running for more than 30 years, this is a fine spot to spend an evening, complete with comfortable deckchairs or director’s chairs and cocktails. Open Air Cinema Kamari is open daily from May until September, with film screenings starting at 21:30. Tickets cost €8. Strolling along Kamari’s seaside promenade is possibly one of the best things to do in Santorini. Enjoy the sweeping views, the peaceful feeling and the numerous cafés to choose from for coffee, lunch or ice cream. 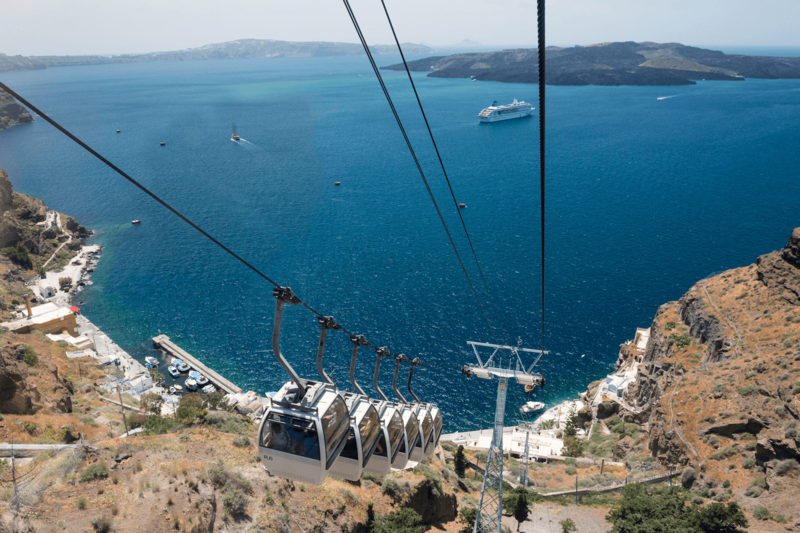 Reach the Old Port by embarking on a cable car journey from Fira. The ride takes just three minutes but offers glorious views of the sea and surrounding islands. The Old Port is a lovely place to spend some time, particularly to buy some souvenirs and to stop for a coffee. The cable car runs from around 06:30 until 23:00, with shorter operating hours over the winter. Tickets cost €6 one-way. This show at The White Door Theatre has captured the hearts and minds of audiences for a number of years. A musical about a 1940s Greek wedding, it offers an insight into Greek culture, and has a true feelgood factor. The White Door Theatre has daily evening performances from May to October. Tickets cost €49 per person, which includes wine and mezze dishes. 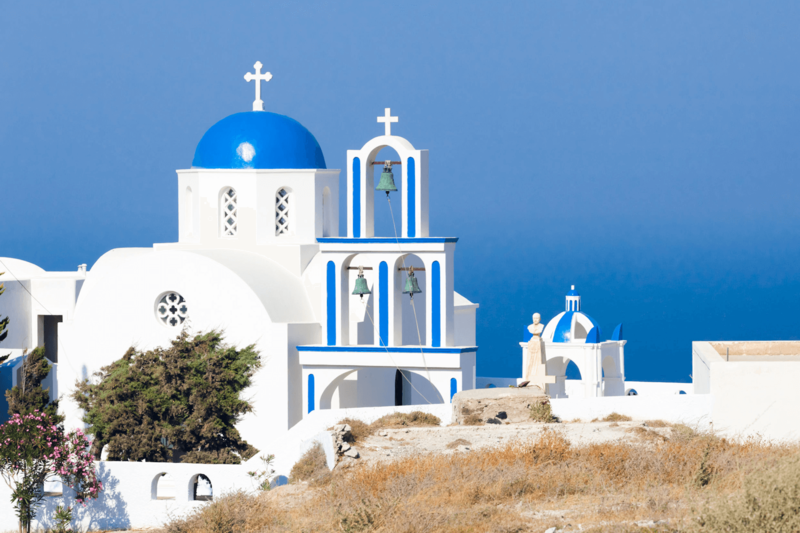 This museum showcases some fascinating artefacts that have been found on Santorini. The collection includes well-preserved vases from the 5th century BC, Hellenistic frescoes, Byzantine artworks and more. There are also some prehistoric vases from Akrotiri. 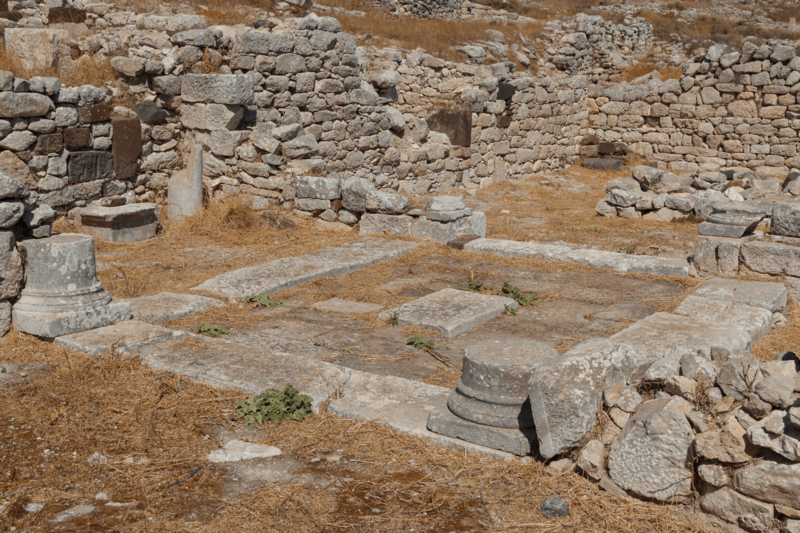 The Archaeological Museum of Thera is open Tuesday to Sunday, from 08:00 to 15:00. Entry costs €4. 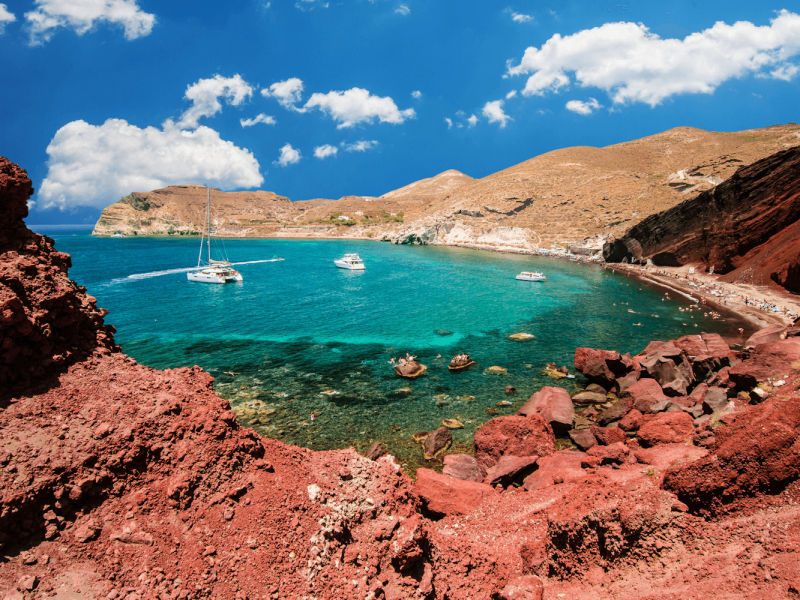 One of the most popular beaches in Santorini thanks to its vibrant red sand, this beach gets its distinctive look because of the vibrant colour of the volcanic rock nearby. The beach has a rugged feeling and is accessible via a rough path, so ensure you wear proper shoes to get there. The beach is also popular with those who love snorkelling. 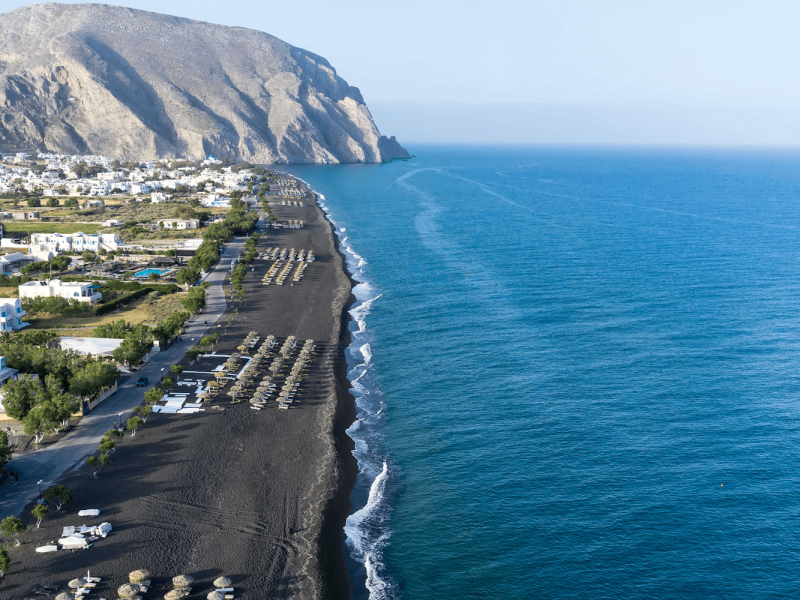 This is one of Santorini’s most popular beaches thanks to its huge expanse of black volcanic sand, abundant water sports and numerous beach bars and restaurants. The villages of Perivolos and Perissa that sit behind the beach are perfect for exploring a variety of traditional Greek restaurants. For a quieter beach that is a little off the beaten track, Vlychada Beach is the place to go. With a wide expanse of grey volcanic sand and dramatic cliffs that run alongside it, this is an alluring beach to spend some time. Sun loungers are available to rent on some stretches of the beach, while various tavernas and seafood restaurants can be found in the small fishing village nearby. This is another long beach and a family-friendly option for those who like to have facilities in easy reach. There are sun loungers and umbrellas available to rent, as well as beach bars and restaurants in case you get peckish. Wandering along the promenade that runs behind the beach also makes for a peaceful afternoon pastime. Since Santorini is so famed for its sunsets, a perfectly romantic excursion from the island is to go on a sunset cruise. There are numerous tour operators offering a sunset experience aboard all types of boats, with food and drinks included. A five-hour sunset catamaran cruise with food and drink costs around €85. See Santorini from a whole new perspective by embarking on a romantic helicopter tour, taking in the volcano and the plentiful whitewashed villages clinging to the island’s clifftops. Choose from 20 or 30 minute helicopter experiences, a sunset helicopter journey or an island hopping adventure to see the surrounding Greek islands too. There are multiple helicopter tour providers in Santorini, with tours starting from approximately €190 per person. There is no shortage of places to eat in Fira. For a tucked-away restaurant located in an enchanting garden setting, Assyrtico is a great option. The menu is filled with traditional Greek cuisines, cooked with modern flair using ingredients sourced from Santorini. There is also an extensive wine list showcasing the best wines from Greece. Assyrtico is open daily from morning until late into the evening. For a high-end meal, Selene is widely hailed as being the classiest dining option in Santorini. Located in Pyrgos, the upstairs restaurant offers a modern twist on local cuisines and is perfect for special occasions. The bistro downstairs also offers a selection of mezze dishes. Selene’s upstairs restaurant is open daily from 19:00 to 23:00, while the bistro downstairs is open from 12:00 every day. This union of wineries in Santorini works with vineyards from across the island to source the best wines. Visit SantoWines to enjoy wine tasting and lunch, with the option of up to 16 flights of wine paired with cheese, seafood platters or four-course menus. This is also a fantastic spot to enjoy fantastic views over Santorini’s caldera. SantoWines is open Monday to Friday from 10:00 to 18:00. 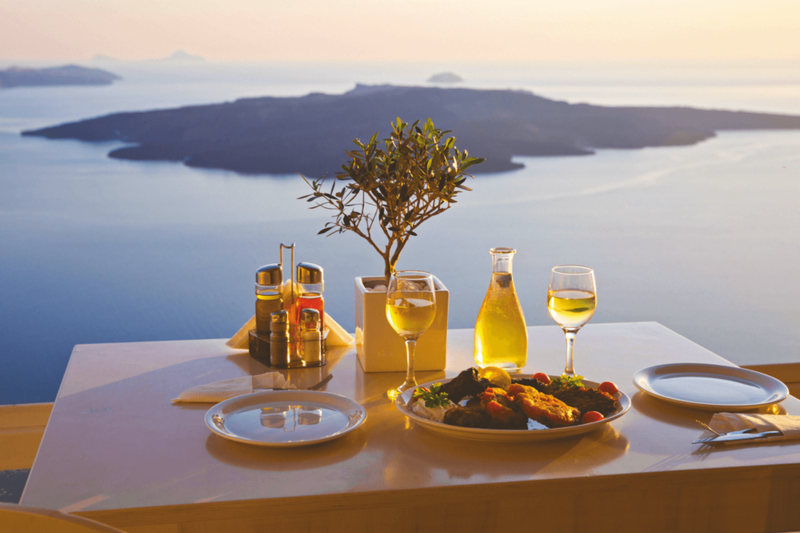 For a one-of-a-kind dining experience in Santorini, book a table at Panorama Balcony at the Canaves Oia Suites. With just one dining table on a balcony offering glorious views of the sea and Santorini’s cliffs, this is an extraordinary and exclusive experience. The cuisine is gourmet Mediterranean and a true delight for the taste buds. Panorama Balcony is open daily from 20:00 to 23:00 – book a table well in advance. The island’s capital is also the best place to shop in Santorini. Ypapantis Street is particularly well-known for its history of gold, and is nowadays the perfect place to go shopping for high-end and artisan-crafted jewellery. 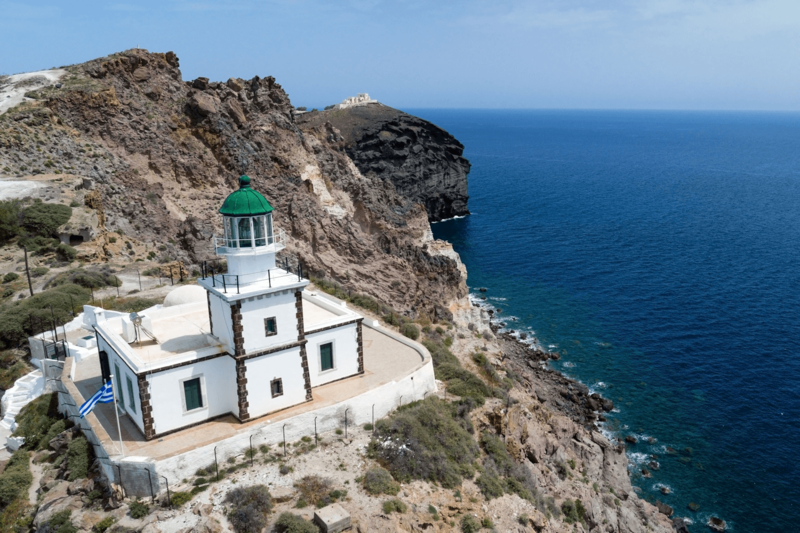 Elsewhere in Fira, find original fashions and plenty of hand-crafted souvenirs. This tomato factory museum and arts centre is actually one of the most unusual but best places to go shopping in Santorini! Learn more about Santorini’s amazing history of cherry tomatoes, take in art exhibitions and musical performances, then buy original pieces by Greek designers, such as one-of-a-kind canvas bags. Another original shopping experience in Santorini, visit Art Space Winery to view art displayed in caves, before enjoying a wine tasting session of wines produced by the family-run winery in the same location. Buy art, wine or both at the end of your visit as a memento of the experience! Art Space Winery is open daily from 11:00 until sunset. This lighthouse was built in the 1890s, making it one of the oldest in Greece. The fascinating architecture and surrounding rugged scenery is a peaceful place to spend some time. Found on the opposite end of the island to Oia, it’s also a less busy place to see Santorini’s famed sunset. Have an alternative spa experience in Fira at this wellness centre where the therapy involves sitting with your hands or feet in a fish tank of Garra Rufa fish. These fish are known for removing the dead skin from the human body – a fact that was discovered more than 200 years ago. The fish therapy also leaves your feet and hands feeling incredibly smooth! Fish Spa Kangal is open daily from 10:00 to 23:00, with fish therapy prices starting from €10. Found in the small village of Megalochori, Symposion is a place to experience folk music inspired by Greek mythology. Housed inside a former winemaking facility, visit Symposion to see vintage instrument exhibitions, enjoy interactive tours, attend instrument-making workshops and immerse yourself in traditional musical performances. Symposion is open from March to November from Tuesday to Sunday between 10:00 and 20:00. Tickets for exhibitions and concerts cost from €10. One of Santorini’s lesser known villages, this is a place to explore narrow paths, charming churches built in the Cycladic architectural style, and enjoy the sunset. The ruins of Skaros can also be found in Imerovigli, where the remains of a 13th century castle can be explored. Have you been to Santorini? We’d love to hear your stories in the comments below. For more Greek Island inspiration visit our post on which Greek Island to visit.